I received a question on my website and I thought it would be useful for many of you as well. You can learn a few things from this one minute lesson. From this question you can learn how to form a sentence with “I am, she is, he is, they are, we are”. 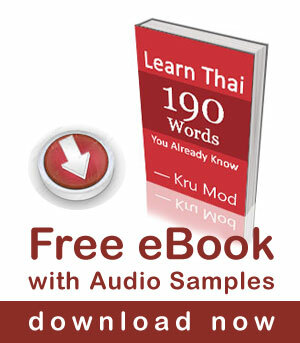 Please click here to learn more about Thai verb to be. ช่วย chûai + do something + หน่อย nòi + ได้มั้ย dâi-mái? chûai láang grà-tà gàwn tam aa-hăan nòi dâai-mái kráp/ká? Thanks for posting this video Kru Mod. Can’t say I’ve ever seen someone teach a language laying down on the beach, you guys always find a way to make things interesting. My favorite vegetarian restaurant in Bangkok is a small local restaurant near Wat Santi Asoke, the Vegetarian Society. The staff are Asoke volunteers. Prices are very good as they sell for little or no profit, they live by a different value system – making merit rather than making money. One thing the Asoke sure know how to do well is cook vegetarian. I don’t think too many tourists know about the place. “Eating vegetarian” in Thai is pronounced “Mang-Sa-Wi-Rat”, though this term is not always easily understood by locals who speak only Thai. When some English is spoken at the restaurants, be sure to tell your server “no fish sauce,” a very common ingredient in Thai cuisine. Fish sauce is called “nam pla”. “Gin che” [“kin jay”], a much more common expression for “eating vegetarian,” conveys a stricter vegetarian diet – it means no eggs, onions, or garlic is consumed. The word of Pali-Sanskrit origin มังสวิรัติ sounds too formal for everyday speech. The word มังสวิรัติ is actually commonly used. You can also say it short ผมกินมัง /pŏm gin mang/. Can we say “I am vegetarian” like this: ผมเป็นคนกินอาหารผัก or ผมเป็นคนกินเจ? What is more natural for everyday speech? กินเจ literally translates “eat vegan”. ผมกินเจ is used to say “I am vegan” in everyday speech. 1. Why do I ask this, because the word มังสวิรัติ (with Pali-Sanskrit origin) looks some formal.